I have a confession to make: I’m one of those readers who has been known to skip over passages full of description to get to the “good stuff.” I love the story of The Lord of the Rings, for example, but my attention wanes during those meandering sections sandwiched between poignant character moments and violent epic battles. With my avoidance of excessive elaboration (and my admittedly poor visual observation skills), I sometimes find it challenging to imbue my own writing with the right level of descriptive pizzazz. And I know I’m not the only one. So I thought it was time to read through the book Description & Setting by author and creative writing teacher Ron Rozelle. His book is part of the Write Great Fiction series by Writer’s Digest, which features some helpful books on a variety of writing topics. I hadn’t read this one yet, and I thought it could be helpful for those of us who feel descriptively challenged. This book covers a wide variety of topics relating to description — even more than I anticipated. Rozelle talks about how to describe both characters and settings. He includes tips for improving dialogue as well as techniques to strengthen exposition. He focuses on the small things, such as the use of adverbs and placement of punctuation, as well as the large things, like establishing the big picture of time and place. There’s a useful chapter on sensory description that includes lots of great examples. I especially enjoyed his chapter “Too Little, Too Much,” which includes some fantastic thoughts on how to avoid repetition, prevent yourself from wandering off track, and recognize when no description at all is perhaps the better approach. This book is an odd mix of wordiness and not enough detail. The introductions to some of the chapters are lengthier than they need to be, while many of the subtopics are not covered in as much detail as they could be. I was looking forward to the chapter on different considerations for different genres, for example, but most of the tips in there are straightforward common sense and didn’t really add to my knowledge. It also suffers from an issue that I find common across many writing books – the examples are taken from older works, and samples from genre fiction are neglected in favour of literary fiction. Since most of the writers I know write genre fiction, I find this to be an unfortunate gap. In Rozelle’s chapter “Using Description and Setting to Drive the Story,” he talks about how to use description and setting to magnify a theme. But instead of focusing on the usual idea of an overall theme, he points out that each scene in the story has its own theme and that you can focus on one scene at a time when determining how the description can be improved. I loved the practical nature of this approach. 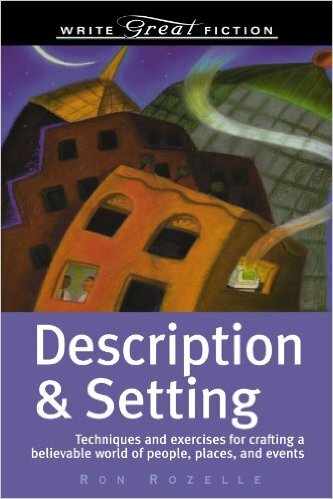 If you don’t have a lot of practice writing fiction yet, or you are looking for a general overview on the topic of description, then I believe this book will be helpful for you. But if you are searching for more in-depth content, I would look for detailed articles relating to your specific interests rather than buying this book. If you are interested in reading about other writing resources, you may want to take a look at my Resources page. One of these resources is Self-Editing for Fiction Writers, which has a great chapter on showing vs. telling. How much description do you like to see in the books you read? What are some of the challenges you face when describing things? Are there techniques that have helped you? Today on my Doorway Between Worlds blog, I have posted a review of writing resource Description and Setting by Ron Rozelle. If you’re looking for help with description in your writing, you may want to come on by! It is a delicate balance, isn’t it? I’ve read some popular sci-fi novels that had so much technical detail in them I lost track of the plot. But many readers were clearly not deterred! Some books I’ll find myself skipping over description, but some books I actually enjoy getting lost in it. It depends a lot on the book, the writer, and my mood. When writing, I have a lot of trouble going on and on and on. I tend to find it difficult reading my own writing and determining what’s interesting and driving the story and what is just me blabbing on about something. I also find it difficult to tell when I’m blathering on. Usually my first cut of anything is too long, and I can trim it a lot after I put it aside for a bit. I really need that distance before I can make any kind of honest self-assessment.